Jaipur is perfectly poised to provide an experience of historical heritage and modern sophistication. For those who are visiting Jaipur for leisure trip and wish to flaunt their prowess at golfing, there is no dearth of well laid golf courses. One of the most prominent names in the list of Golf Courses near Jaipur, Rambagh Golf Course, a part of Rambagh Palace hotel, is an 18 hole course with 9 greens and 9 browns. It offers you facilities such as club house, caddies and practice area. Other famous places for golfing in Jaipur are Cambay Golf Resort and Army Chinkara Golf Course. 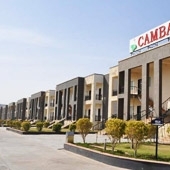 Cambay Golf Resort Jamdoli is a luxurious Golf resort in Jaipur, sprawled over an area of .162 sq km. There also is a multi-cuisine restaurant to tantalize the tastebuds of the guests. The resort also serves as a great venue to host corporate events and weddings. Address: Agra Highway,Jamdoli, Jaipur - 302 023, Rajasthan.